2 British beef steak mince burgers, lightly seasoned. Our Tesco Finest beef burgers are made with tender and succulent British beef. 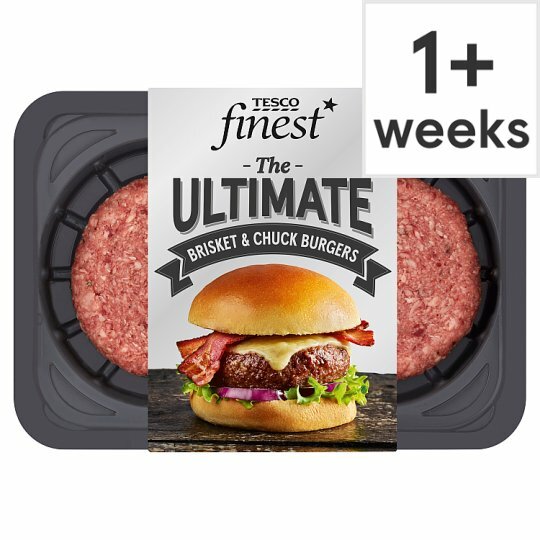 These brisket and chuck burgers use succulent cuts of prime Aberdeen Angus beef and are simply seasoned for the ultimate burger. British Beef (91%), Water, Rice Flour, Dried Potato, Sea Salt, Yeast Extract, Dextrose, Black Pepper, Salt, Preservative (Sodium Metabisulphite), Rapeseed Oil, Emulsifier (Mono- and Di-Glycerides of Fatty Acids), Flavouring. Scotch Beef PGI Beef (91%), Water, Rice Flour, Dried Potato, Sea Salt, Yeast Extract, Dextrose, Black Pepper, Salt, Preservative (Sodium Metabisulphite), Rapeseed Oil, Emulsifier (Mono- and Di-Glycerides of Fatty Acids), Flavouring. Instructions: Place on a baking tray in the centre of a pre-heated oven. Turn once halfway through cooking time. Instructions: For best results grill. GRILL 24-28 mins. Place under a pre-heated grill for 12-14 minutes each side. Turn once halfway through cooking time. Leave to stand for 5 minutes after cooking. Instructions: Alternatively, pan fry for 1 minute each side then transfer onto a baking tray and cook for 25 minutes. Caution: This product contains raw meat.Caution: Although every care has been taken to remove bones, some may remain.Packaged in a protective atmosphere.Made from fresh and frozen meat.